Great for office forms, this printable complaint letter demands a new copy machine. I am writing to express my extreme displeasure with the CopyMax 3000 multi-function printer your sales representative sold me on Jan. 10, 2010. Contrary to the rep's assertions, the printer is loud and slow. Not only is the printer faulty, it does not have the features I require. I believe I was crystal clear when I told your rep that our office requires a machine capable of unattended duplex printing. It was not until my office manager had set up the printer that she realized that unattended duplex printing is not within the capability of the CopyMax 3000. Therefore, I will be returning the copier and asking your company to waive the 10 percent restocking fee. Please contact me at your earliest convenience to schedule a time to pick up the copier, and to confirm the full refund. 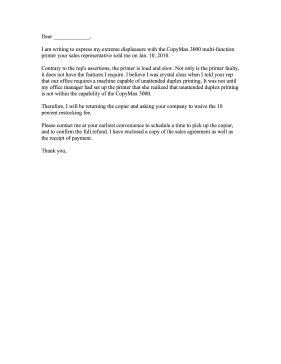 I have enclosed a copy of the sales agreement as well as the receipt of payment.